Jablonski, Daniel. 2015. 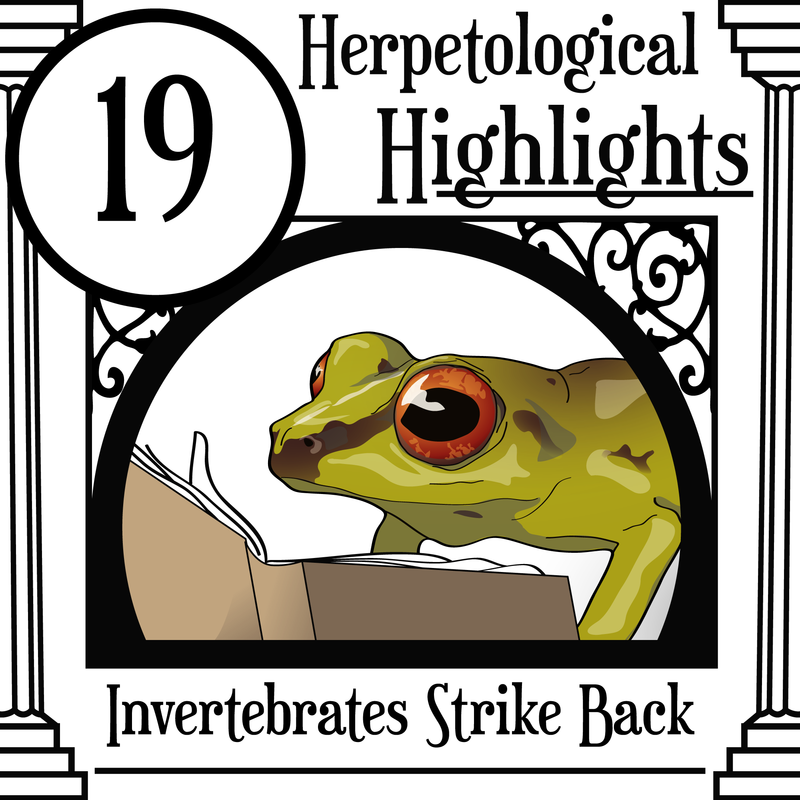 “Predation on Pristimantis ridens (Cope, 1866) by a Wandering Spider (Ctenidae Keyserling, 1877) in Mountain Cloud Forest of Costa Rica.” Herpetology Notes 8:1–3. Luiz, Amom Mendes, Thiago Augusto Pires, Victor Dimitrov, and Ricardo Jannini Sawaya. 2013. “Predation on Tadpole of Itapotihyla langsdorffii (Anura: Hylidae) by the Semi-Aquatic Spider Thaumasia Sp. (Araneae: Pisauridae) in the Atlantic Forest, Southeastern Brazil.” Herpetology Notes 6 (1):451–52. Rödel, Mark Oliver, Christian Brede, Mareike Hirschfeld, Thomas Schmitt, Philippe Favreau, Reto Stöcklin, Cora Wunder, and Dietrich Mebs. 2013. “Chemical Camouflage - A Frog’s Strategy to Co-Exist with Aggressive Ants.” PLoS ONE 8 (12). Rivadeneira, C. Daniel, Pablo J. Venegas, and Santiago R. Ron. 2018. “Species Limits within the Widespread Amazonian Treefrog Dendropsophus Parviceps with Descriptions of Two New Species (Anura, Hylidae).” ZooKeys 726:25–77. Menin, Marcelo, Domingos de Jesus Rodrigues, and Clarissa Salette de Azevedo. 2005. “Predation on Amphibians by Spiders (Arachnida, Araneae) in the Neotropical Region.” Phyllomedusa 4 (1):39–47. Miranda, Everton B. P. de. 2017. “The Plight of Reptiles as Ecological Actors in the Tropics.” Frontiers in Ecology and Evolution 5:159. Rödel MO, Braun U (1999) Associations between anurans and ants in a West African savanna (Anura: Microhylidae, Hyperoliidae, and Hymenoptera: Formicidae). Biotropica 31: 178–183. Toledo, L. F. (2005). Predation of juvenile and adult anurans by invertebrates: current knowledge and perspectives. Herpetological Review, 36(4), 395-399. Vrcibradic, Davor, Rogério L. Teixeira, and Vitor N.T. Borges-Júnior. 2009. “Sexual Dimorphism, Reproduction and Diet of the Casque-Headed Treefrog Itapotihyla Langsdorffii (Hylidae: Lophiohylini).” Journal of Natural History 43 (35–36):2245–56. Ward-Fear, Georgia, Gregory P. Brown, Matthew J. Greenlees, and Richard Shine. 2009. “Maladaptive Traits in Invasive Species: In Australia, Cane Toads Are More Vulnerable to Predatory Ants than Are Native Frogs.” Functional Ecology 23 (3):559–68. Ward-Fear, Georgia, Gregory P. Brown, and Richard Shine. 2010. “Factors Affecting the Vulnerability of Cane Toads (Bufo Marinus) to Predation by Ants.” Biological Journal of the Linnean Society 99 (4):738–51.